When you get the news that you are going to have to make a drastic diet change (and it’s not by choice), it can be devastating! And then when you realize that cutting dairy and soy from your diet is A LOT more involved than you at first believed, it can feel like the end of the world. Especially if you like sweets and desserts. 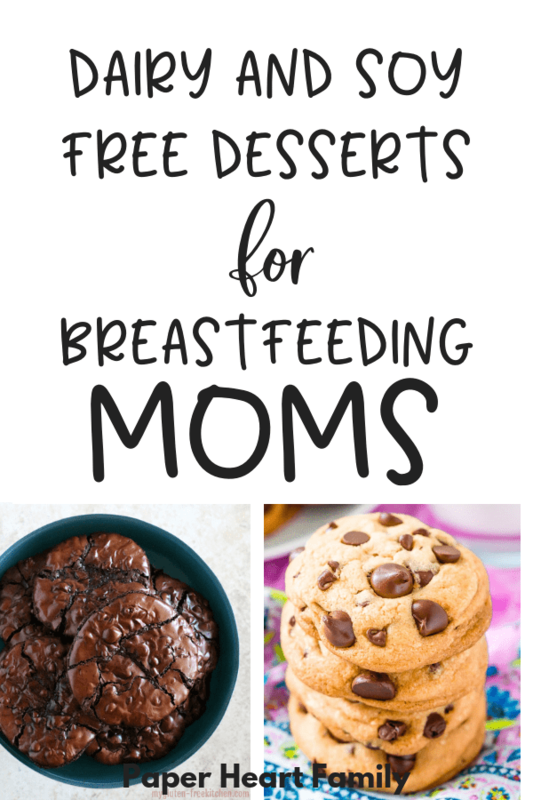 Thankfully, there are a lot of dairy and soy free desserts for breastfeeding moms, and I’m going to share some of my favorites with you today. Both of my babies had a dairy milk allergy, and so I’ve been through this on two separate occasions. Are you struggling on this diet? Barely hanging on? Get this 7-day meal plan full of delicious, good for you and your milk supply recipes. Before I realized that there were desserts that I could make super quickly and easily, I ate WAY too many Oreos (they are MSPI-safe). Like, I’m not even going to tell you how many bags of Oreos I ate. Enough that I may never want to eat another Oreo again. I’ve also included some recipes that would work great around the holidays, because that was always the hardest for me. I actually prepared my own turkey dinner and took a pre-prepared plate with me to the three different Thanksgiving dinners that I attended one year. Just remember that you are eating a healthier diet these days, so a little dairy and soy free indulgence is quite all right. If you’re just starting out and don’t really know what you’re doing, check out my beginner’s guide to MSPI and nursing. If you’re looking for something super indulgent, but healthier, this Pumpkin Coconut Creme Brulee is amazing (and surprisingly simple to make). It doesn’t get much easier than these Oatmeal Energy Balls. Simply combine the ingredients, roll and refrigerate. And thanks to the oats, these are milk supply boosters, too. Have you ever made Coconut Oil Chocolate Chip Cookies? If you haven’t, beware, you may never go back! Just make sure to use Enjoy Life chocolate chips. Blueberry Chocolate Chip Banana Bread. I don’t think I need to say anything more. If you have older kids, why not make these Almond Milk Fudge Pops together. Then you’ll have a sweet treat that everyone in the family will enjoy. Flourless Chocolate Mudslide Cookies are better than Oreos and are healthy too. You’ll forget that you miss dairy with these! These Apple Crumble Muffins are like an apple pie in muffin form. Banana, Coconut and Blueberry Loaf with a delicious icing on top? So good you’ll have to hold yourself back from eating the entire loaf before it even cools. Super simple and reminiscent of those chocolate covered blueberries that you can buy for 10 dollars a bag at the supermarket. These Chocolate Blueberry Nut Clusters are far superior. The holidays can be extra difficult when you’re unexpectedly (and unwantedly) dairy free. But don’t worry, this Dairy Free Pumpkin Pie will save the (Thanksgiving) day. Even if it’s not Thanksgiving, if you want the pie, eat the pie. Thinking that you can’t eat cake? Think again! This Vanilla Raspberry Oreo Cake just might have to be made by me. Like, right this instant. If you love these recipes, but want MORE, check out my Complete Guide On Dealing With MSPI. It not only contains over 100 recipes, but it also includes everything you need to know about MSPI so that you can continue to breastfeed your baby for as long as you’d like.